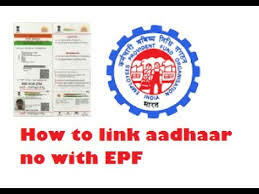 EPFO members with authenticated Aadhaar card number and Bank details updated against their Universal Account Number can submit their Provident Fund withdrawal/ settlement/ Transfer claims online. One phone number can be used for one registration. EPFO members can see the passbooks of the EPF accounts which has been updated with Universal Account Number. All subscribers can submit claims directly to EPFO without employer's attestation. You can receive monthly updates on registered mobile number with Universal Account Number. You can download e-passbook any time from the portal. You can file/ update nomination form online and edit personal details. You have the facility to link multiple EPF accounts. 2) Click on e-Passbook, login using your UAN number and Password. 3) Once you login - Go top of the page - Manage tab. Select the KYC option under Manage tab dropdown menu. 4) You can see an online form with options to update Bank details, PAN details, Aadhaar, Passport, Driving License, Voter Id Card, Ration Card or NPR. 5) If you want to update Aadhaar number then select Aadhaar, enter the Aadhaar card number and name as it appears in Aadhaar Card. Click on Save. Your Aadhaar number is now linked with Universal Account Number UAN.